​Comparing loose diamonds for an engagement ring? Don’t be dismayed by the dizzying array of choices. The important thing is to compare wisely. Here are six easy steps to help you pick a diamond that’s beautiful and a smart purchase. 1. Color: Within the D-to-Z range, less color is rarer and more valuable. 2. Cut: How well a diamond’s facets interact with light is determined by the quality of its cut. 3. Clarity: This refers to the presence or absence of inclusions in the stone and blemishes on the surface. 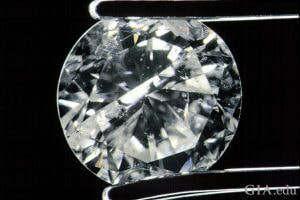 Numerous inclusions and blemishes mar the appearance of this diamond. An internally flawless diamond is a thing of beauty. ​Photo: Robert Weldon/GIA. Courtesy: Rogel & Co. Inc.
4​. Carat Weight: The measurement, in metric carats, of how much a diamond weighs, its mass or size. Inclusions and blemishes are typically more easily seen with the unaided eye in emerald cut diamonds. It might be possible to see an SI1 inclusion in an emerald cut, but this one has a clarity grade of VS1, so it should be pleasing to the eye. This 10.09 ct old mine cut diamond, precursor to today’s modern cushion brilliant cut, should satisfy anyone enamored with carat weight. ​IMPORTANT TIP #1: Only compare diamonds graded by the same lab. Different labs may have different grading standards. GIA has nine labs around the world that grade diamonds, and all of them adhere to the same strict grading standards. GIA will not issue reports on color- or clarity-enhanced diamonds where the enhancement is not permanent. 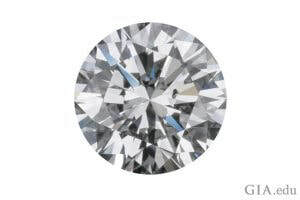 ​IMPORTANT TIP #2: While a grading report from a reputable laboratory will provide you with an objective assessment of a diamond’s quality, the report will not tell you what the diamond will look like in person. Color, clarity and cut grades represent ranges. So diamonds with the same grades on paper can look different when compared side-by-side. Visit a jeweler to compare loose diamonds in person, which leads to tip #5.